If you’ve never come across the complaints about hopefully, you might be surprised by the fuss it attracts. It’s one of those familiar but divisive words with a regular slot in style guides and usage dictionaries. The AP Stylebook (2007 edition) says: “It means in a hopeful manner. Do not use it to mean it is hoped, let us or we hope.” The trouble is, most people who speak English (at least in my experience) use it to mean it is hoped, let us hope, or we hope – that is, as a sentence adverb. I use hopefully both ways, and I like having this option. Declaring that it’s wrong to do so is, frankly, a lost cause: a futile attempt to deny or halt a natural drift in language. I mentioned hopefully in a previous post about skunked words – though to call it skunked might be overstating matters. Except in rare instances where ambiguity is possible, no one who hears the popular usage is confused by it. Regrettably, however, people will be misled about its acceptability if they rely excessively or exclusively on the AP Stylebook. Maybe hopingly or hopeably will come into fashion, but I doubt it. Adverbs have been used to qualify entire clauses and sentences for centuries. Clearly, it’s a useful feature, one I’ve made use of in this very sentence and elsewhere in this post. In the second half of the twentieth century, the occurrence of certain sentence adverbs grew rapidly, according to Robert Burchfield in The New Fowler’s Modern English Usage (actually and basically are often criticised too). This might explain the concurrent surge in objections, but it doesn’t justify them. Hopefully started out meaning “in a hopeful” manner. It later took on another sense. Words do this. Arguing that the older meaning is the only legitimate one (see also: decimate) will soon get you in trouble because, as Gabe Doyle points out in his post about hopefully at Motivated Grammar, “if you’re not willing to use a non-original meaning of a word, you’re going to have to excise a substantial portion of your vocabulary”. Hopefully is fine – and standard – as a sentence adverb. Seriously. Insisting otherwise smacks of obstinacy. John E. McIntyre, on his You Don’t Say blog, writes: “Stubbornly, this superstition refuses to go away, and sadly, no amount of explanation suffices to wipe it out.” Mercilessly, I’ve added my two cents. Usefully, language is big enough, old enough and flexible enough to accommodate more than one meaning per word. I find the AP Stylebook’s advice very poor on this point, Michael. It flies in the face of widespread and long-established usage. Every so often, I come across a blog post that parrots the misinformation about hopefully, and the comments pour in from people appalled at themselves for having been ‘wrong’ all their lives and determined now to spread the (wrong) word. Gah! Given its considerable influence on journalists, writers and editors, the AP Stylebook should know better than to propagate this nonsense. As for decimate: MWDEU, supporting your point, says that the word “has seldom meant ‘to destroy every tenth man’ in English, and then only in historical references.” I’ve debated people over this one, generally to little avail. They see the facts and decide they prefer the world with peeves intact! Ralph Waldo Emerson was presciently talking about prescriptivists, when he penned the now cliched, and usually misquoted, “A foolish consistency is the hobgoblin of little minds.” Far-right prescriptivists are indeed “foolish” in the original sense of that word, and they certainly are people of “little” mind. I say, unhopefully, that we may be able to ignore them one day. Marc: Extreme prescriptivism seems to result at least in part from a fundmental misapprehension of how language works. The fixation on rules that are often bogus, and meanings that might be outdated, and the presumption that these ‘rules’ and meanings are or should be universal and eternal — or foolishly consistent. This is not the language I know and love, which shifts and shimmies and unfolds anew every time it is used. Couldn’t agree more; it’s hard to see what the problem is with this one. It’s clear. It works. It’s useful. Everyone understands it. Great :). Exactly, Oliver. In some cases I think the problem stems (at least partly) from what Arnold Zwicky has called the One Right Way principle — or fallacy — that an expression can have only one acceptable meaning, or that a meaning can have only one acceptable form. 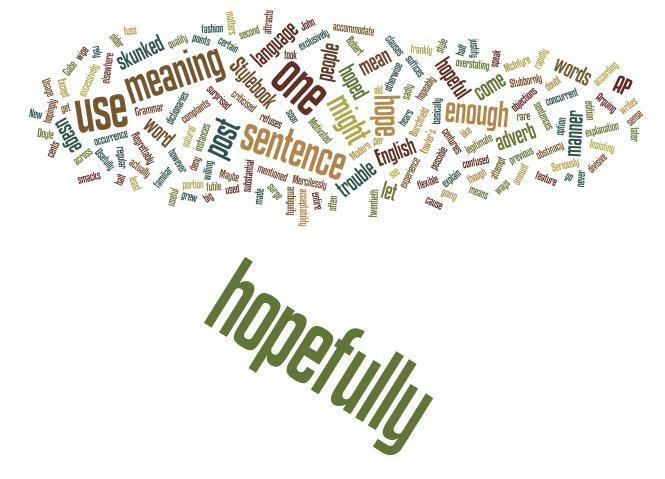 The popular meaning of hopefully is still just decades old. In another generation or two, the problem should have all but evaporated. My own somewhat trivial problem with decimate is that it is often used to mean “reduced *to* a tenth, or a very small proportion of the original”. Often with the modifier “literally”. So, while I agree it’s not skunked (its usual meaning of “seriously depleted” is unambiguous), it’s not a word I use. I won’t be moved on “electrocute”, though. Indy: That’s a further complication. Very few people, I think, use it to mean “reduce by a tenth” or “kill/destroy a tenth of”, except when they’re discussing the word and insisting that that’s what it means. I don’t use it either, and I might never. Real Vocabulary Quiz, Question 6: is it acceptable to use “decimate” to mean “kill or destroy in large numbers”?